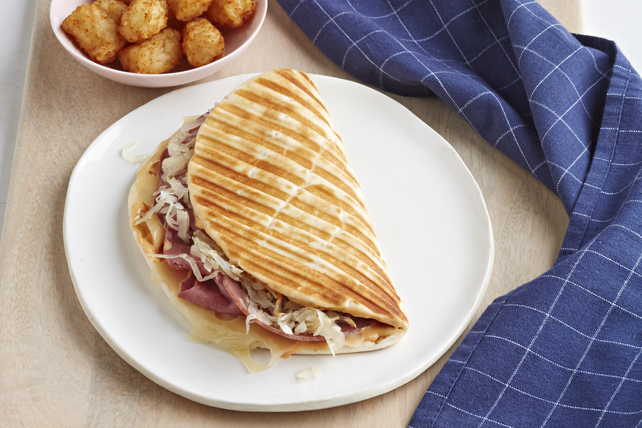 A classic Reuben sandwich gets grilled to perfection in our Grilled Reuben Flatbread recipe. Lunch for one is served! Place flatbread on microwaveable plate. Microwave on HIGH 10 sec. or just until bread is warmed; spread with dressing. Place remaining ingredients on half the flatbread; fold in half. Grill 2 to 3 min. or until cheese is melted and sandwich is golden brown. Heat large skillet on medium heat. Cook sandwich 3 min. on each side or until cheese is melted and sandwich is golden brown on both sides, gently pressing down top of sandwich with spatula to flatten slightly as it cooks.